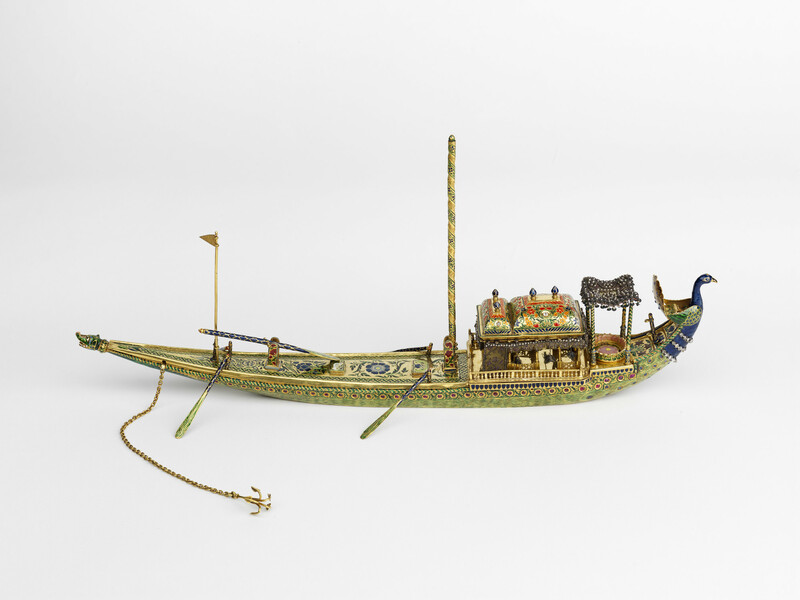 An enamelled gold and jewel encrusted inkstand in the form of a barge with oars, an anchor, flagpole and mast. The prow of the model represents a peacock with a spread tail, enamelled with incised blue and green detail inlaid with sapphires and diamonds. The stern is in the form of the head of a makara, a dragon-like mythological creature associated with Hindu iconography. The canopied section near the peacock formed of silk embroidered with pearls, glass beads and silver wire suspended above four rods and a lotus-shaped seat, or palki. The second canopied section, or chattri, made of gold and enamelled with floral designs in green, orange, red and blue and inlaid with diamonds. The canopy is fringed with textile decorated with coloured threads, seed pearls and tinsel. The deck of the ship is enamelled with birds and flowers and can be lifted to reveal two inkwells, a pair of scissors, a penknife and two pen nibs. The mast engraved with a dedication to the Prince of Wales and the flag decorated with two fish to represent the Benares coat of arms. Enamelling had been introduced to the Indian subcontinent by European craftsman based in Portuguese Goa during the late sixteenth century. By the late nineteenth century, enamel production had been established in several centres in north India, each developing its own style and colour palette. Although Benares also specialised in enamelling, this inkstand was made in Jaipur.